Well, Professors Henrik Scharfe and Hiroshi Ishiguro are at it again. A few weeks ago they held a Geminoid ‘Summit’ where the 3 super realistic android robots got together with the humans they were designed after for a cool and somewhat uncomfortable looking photo & video op. Watch the video to see them sitting around and having creepy small talk. Henrik Scharfe is an associate professor at Aalborg University in Denmark and Director of the Center for Computer-Mediated Epistemology which is essentially is a theory that asks things like what is knowledge?, where do we acquire it? and how do we perceive and conceptualize human existence and understanding? 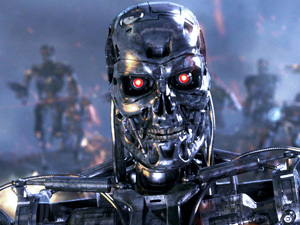 Well…bring on the robots! 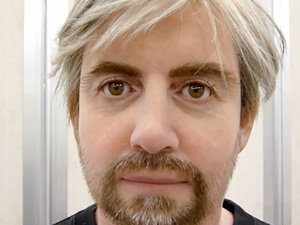 Professor Scharfe has teamed up Professor Hiroshi Ishiguro of ATR [Advanced Telecommunications Research Institute International] and the Tokyo-based firm, Kokoro. 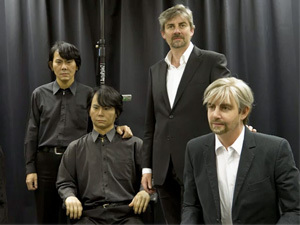 Together they have created Geminoid DK, an android, designed to look exactly like Professor Scharfe which is controlled through a computer system that replicates the facial movements of the operator.